The 2016-2017 officers, members and visitors at the meeting of the Board of Directors of the Dominican Development Group in Santo Domingo on February 15, 2016. First row, from left: David Morrow, Treasurer, Northwest Texas; Bill Kunkle, Executive Director, Southwest Florida; the Rev. Deacon Beth Drew, President, Western Michigan; the Rt. Rev. William J. Skilton, Dominican Republic; the Rt. Rev. Julio C. Holguín, 1st Vice-President, Dominican Republic; the Rt. Rev. Moisés Quezada, Dominican Republic; Virginia Norman, Dominican Republic; Karen Carroll, Dominican Republic. Second row, from left: The Rt. Rev. Rob Skirving, East Carolina; the Rev. Deacon Alexander Romero, Dominican Republic; Rafael Griffin, New York; the Rev. Rhonda Rubinson, New York; the Rt. Rev. Wendell N. Gibbs, Jr., 2nd Vice-President, Michigan; Julia Ariail, Secretary, Georgia; Sally Thompson, Southwest Florida; the Rt. Rev. J. Michael Garrison, Southwest Florida; Meredith McGowan, Nebraska; Tom McGowan, Nebraska; Patricia Martin, Dominican Republic. 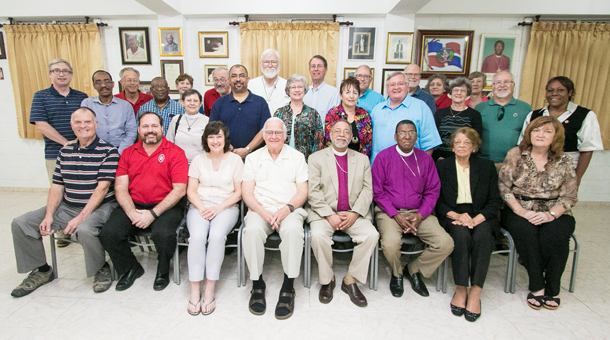 Third row, from left: Bob Stevens, Southwest Florida; Laura Morrow, Northwest Texas; the Rev. Deacon Bob Snow, Nebraska; Julius Ariail, Georgia; the Rev. Ed Miller, Virginia; the Rt. Rev. Scott Mayer, Northwest Texas; the Rt. Rev. Todd Ousley, Eastern Michigan; the Rev. Tar Drazdowski, Nebraska; Ellen Snow, Nebraska.